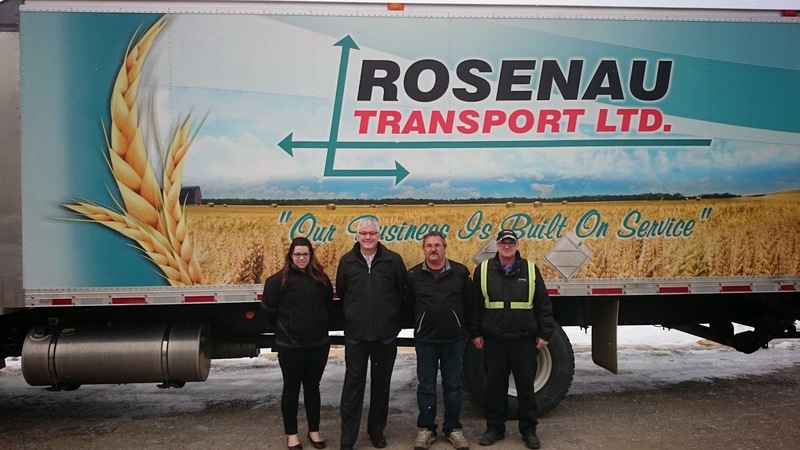 Nicole Sinclair - STA; Steve Compton - Regina Food Bank; Gary and Tony - Rosenau Transport Ltd.
Nicole Sinclair from the Saskatchewan Truckers Association along with the 18 Wheels of Christmas arrived at the Regina Food Bank Today to deliver a $1000.00 cheque along with some food donations. Saskatoon 18 Wheels of Christmas 2014 Wrap Up! What a truly exciting and fulfilling year for our campaign here in Saskatoon! We are thrilled to announce that in Saskatoon our supporters pulled together and raised $8,182.25 enabling us to provide those in need with 8,565 pounds of food! Once again our Potash Corp here in Saskatchewan will double all monetary donations. THANK YOU! We enjoyed setting up the Christmas trailer at the Independent Grocers to help raise money, and collect donations. We sold raffle tickets for the public’s chance to win gift certificates for The Keg Restaurant ($200.00), Chili’s ($150.00), and Tim Horton’s ($100.00). 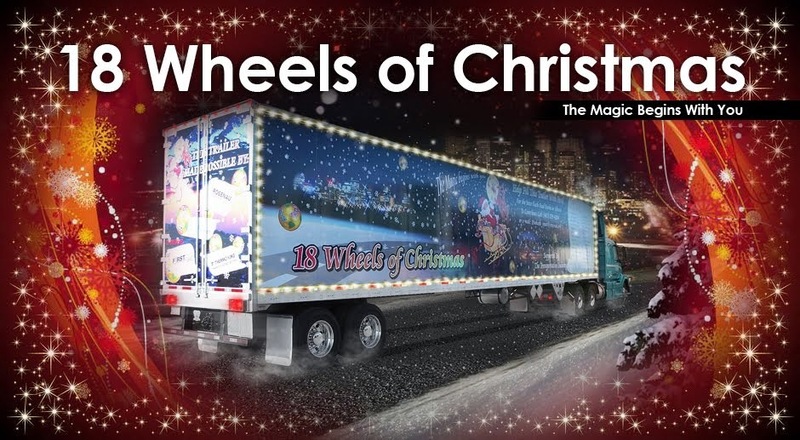 The 18 Wheels of Christmas trailer was also involved with The Saskatoon Parade. It was exciting to see the smiles on everyone’s faces as we walked alongside the trailer handing out candy canes to all the children. We also had a fantastic turn out from the Walter Murray Collegiate collecting 2 and a half full skids of food! I would also like to take this opportunity to welcome The Saskatchewan Truckers Association as I received a call from Nicole who works with them out of Regina. They have joined with us to collect monetary donations and food donations for the Regina Food Bank as well. Mr. Sandeen and Mr. McCauley of the Regina Food Bank are thrilled to hear that she will be helping with the 18 Wheels Of Christmas campaign down in their area.